I'm a bit attention deficit with my sewing at the moment. A bit of this, a bit of that and not too much that I can show you yet. Firstly I'll tease you with a little taster of a project that I'm working on. No details yet, but I love how its coming together! Next I can show you the progress that I have made on the ladybird and butterfly baby quilt. My lack of planning and foresight is threatening to disrail this project, but I am determined to make it work in some way, shape or form. The problem is that I have run out of almost all of these fabrics, so I need to use other fabrics for the large butterfly and ladybird.Then I need to work out how to put all the random differently sized blocks together. When I showed the blocks that I have made so far to Mr Tartankiwi and explained that I have sewed myself into a corner, he just smiled. "You've done that before" he said "You'll find a way out!" Linking up with WIP Wednesday over at Freshly Pieced. Oh, and lets not mention the Sampler quilt? !- OK? Ohh I really want to see what block number 1 will be made into! it looks really good! Visiting from freshly pieced. The blocks look great - all the best figuring out the baby quilt! Love the selvedges on the books!! 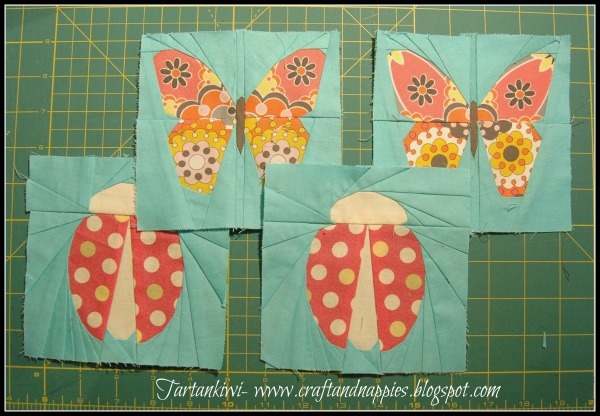 Fab paper piecing - just love those butterflies! You are a clever bird. Love the look of that book case thingiee whatever it is! Love the books block!! Keep going with your butterflies and lady bugs, they are awesome and I am sure you will find a way to bring it all together!! LOVE the books! I bet Mr Tartankiwi is right. Go girl! Most of us flit from one project, to keep us interested, don't we!? Both your projects are great- what clever paper pieced blocks! 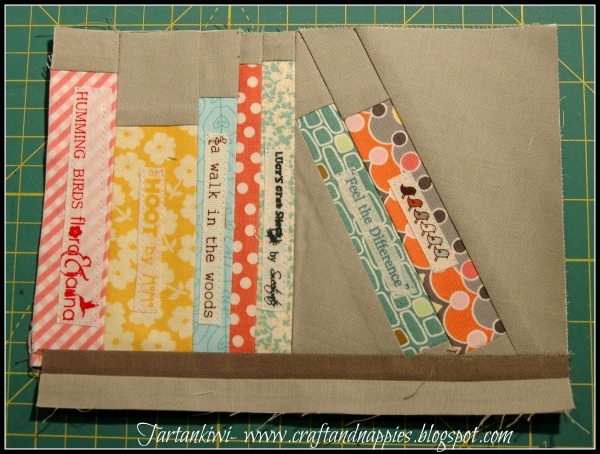 Look forward to seeing what you make with the books block. I've just finished a Library Bag with selvedges as books, but I did mine with appliqué, instead of paper piecing. I'm loving your books. So creative! Oh I love your blocks, the butterfly and ladybugs are soo cute, but I am loving your first block...I need to do something like that, LOVE it!!! Hi Juliet - is it the pink or orange silent cinema in the butterflies? I have a some silent cinema in my stash I could pass on. I'm loving the bookshelf block too, can't wait to see how it all turns out.